Objective: The objective of the current study was to assess the impact of weight reduction on the attenuation of obesity-related periodontal inflammation. Methods: This study was conducted enrolling 60 obese subjects. They were divided into three groups of 20 each. Group 1-healthy group, Group 2-gingivitis group, and Group 3-periodontitis group. The body mass index and waist/hip ratio, periodontal parameters such as plaque index, bleeding index, full mouth periodontal probing depth (PPD) using the University of North Carolina 15 (UNC 15) probe and full mouth clinical attachment loss (CAL) with cementoenamel junction as the reference using UNC 15 probe was evaluated at baseline and after the attainment of ≥10% weight loss by the subjects. 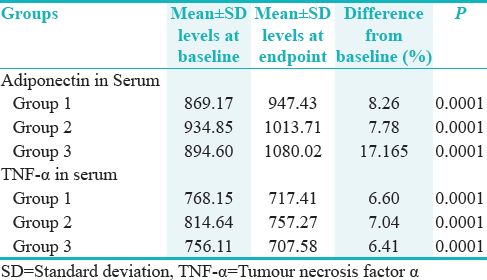 Adiponectin and tumor necrosis factor-alpha (TNF-α) levels were measured in the serum at baseline and after attainment of ≥10% reduction in weight in a period of 3–18 months. Results: Adherence to weight reduction program until the achievement of ≥10% reduction in body weight resulted in statistically significant (P < 0.0001) elevated serum adiponectin and reduced serum TNF-α levels in all three groups. Furthermore, elevations of adiponectin following weight reduction showed significant negative correlations with PPD in all the three groups and in patients with periodontitis, (Group 3) serum adiponectin levels showed significant negative correlations (P = 0.0001) with CAL in Group 3. Conclusions: Controlling obesity presents a good opportunity to alleviate the burden of periodontal disease. Simple weight reduction programs with diet and exercise-related lifestyle modifications may be an efficacious and barrier-free option. Obesity is a complex multifactorial chronic disease that develops from an interaction of genotype and the environment. The World Health Organization (WHO) has recognized obesity as a predisposing factor to major chronic diseases ranging from cardiovascular disease to cancer. It has been suggested that obesity contributes to an overall systemic inflammatory state through its effect on metabolic and immune parameters, thereby increasing susceptibility to periodontal disease., A number of studies have reported an association between obesity and periodontal disease in both animal models and humans.,, Several epidemiological studies and controlled clinical trials have also implicated the association of obesity and periodontitis. Khader et al. in their study showed that overweight individuals had double the incidence of periodontitis while obese individuals had triple the incidence of periodontitis, thus demonstrating a dose-response relationship. The biological mechanisms for the association of obesity and periodontitis most likely involve adipose tissue-derived cytokines and hormones. Adipose tissue produces various cytokines and hormones, collectively called adipokines, which may modulate periodontitis., These released adipokines are leptin, tumor necrosis factor-alpha (TNF-α), interleukin-6 (IL-6), IL-8, monocyte chemoattractant protein-1, and adiponectin. Adiponectin is mainly produced by adipocytes. The plasma levels decrease in obese individuals as compared to normal-weight individuals. It also has anti-inflammatory, vasoprotective, and antidiabetic effects. These effects occur due to suppression of TNF-α and IL-6, along with induction of IL-1 receptor antagonist. In spite of the various evidence available, the role of obesity on the periodontal health is still not very clear. The association between obesity and periodontitis could be, at least in part, due to common lifestyle characteristics that make subjects more prone to both obesity and periodontal disease. However, maintaining normal body weight, eating a well-balanced diet and engaging in physical activity have been shown to reduce the severity of periodontitis., Thus, all health professionals, including the dental team, can provide an important service to patients with obesity by educating them about the risk of periodontal disease and the importance of proper oral hygiene. To our knowledge, there is sparse literature estimating the relationship between adiponectin and TNF α levels in the serum of obese individuals suffering from periodontal disease before and after weight loss. Hence the present investigation evaluates the impact of weight reduction on the adipokine, adiponectin and TNF-α levels in the gingival crevicular fluid and thereby on the periodontal status of obese patients with and without periodontal disease. This study was conducted to assess the association between obesity and periodontal disease in the Indian population. The study was conducted at the M. R. Ambedkar Dental college and Hospital, Bengaluru. The participants were referred from Bangalore-based health clubs promoting weight loss through lifestyle modifications. All the study participants signed an informed consent form and the study was approved by the Institutional Ethics Committee. (Ref no: MRADCandH/ECIRB/024/2010-11). All the parameters were evaluated by the principal investigator. Based on the available literature on serum adiponectin levels in periodontal disease the difference of 2.1 μg/ml after weight loss among participants, the sample size was estimated to be 20 (inclusive of attrition 10%) to detect the 2.1 μg/ml as a significant difference. The sample size estimated keeping 80% statistical power and 5% level of significance overall, in a three group study total of 60 subjects are recruited for testing research hypothesis. The subjects were divided into three groups of 20 each as. GROUP 3 - Obese patients with periodontitis. Patients on steroid therapy and oral contraceptives. No or incipient attachment loss (≤2mm). Patients with ≥20 teeth excluding third molars with minimal or no attachment loss and probing depth (PD) of ≤3 mm. Patients with ≥20 teeth excluding the third molars with at least 8 teeth showing ≥3 mm of clinical attachment loss (CAL) and ≥5 mm of probing pocket depth. Participants included in the study were advised on oral hygiene techniques to manage their condition. Furthermore, participants requiring immediate interventions for gingivitis and periodontitis were excluded from the study. In obese individuals the BMI was calculated by measuring the weight to the nearest 0.1 kg, and measuring the height to the nearest 0.5 cm, (kilograms per meter squared). Waist-hip ratio (W/H) was calculated by measuring the minimal abdominal circumference between the xiphoid process and the iliac crests (waist) with participants standing and breathing normally, this was divided by the hip circumference, measured on the greater trochanters. These measurements were done before and after weight reduction. The patients were also subjected to routine blood investigations and lipid profile. Periodontal parameters, namely bleeding index (BI), plaque index (PI), full mouth periodontal PD (PPD) using the University of North Carolina 15 (UNC 15) probe and full mouth CAL with cementoenamel junction as the reference using the UNC 15 probe was evaluated at baseline and after the attainment of ≥10% weight loss by the subjects. A 2 ml sample of peripheral venous blood collected by venipuncture was centrifuged and serum separated. The collected serum samples were stored at −70°C for further evaluation. The serum samples were collected at two-time intervals, one at baseline and the other after attainment of ≥10% weight reduction in a period of 3–18 months. The stored serum samples were then evaluated for serum adiponectin and TNF-α using commercially available enzyme-linked immunosorbent assay kit (RayBiotech, Inc. 3607 Parkway Lane, Suite 200, Norcross GA 30092) at baseline and after attainment of the primary endpoint. Results are presented as mean ± standard deviation and proportions are presented as percentages. Analysis of variance was used to compare means across the three groups of the study. t-tests were used compare means between two groups. Pearson's correlation was used to assess the relationship between the concentrations of adiponectin and periodontal parameters. Level of significance was set at 0.05. The tests were conducted using SSP version 19.0 (IBM, Bangalore, Karnataka, India). All the study participants signed an informed consent form, and the study was approved by the Institutional Ethics Committee. The study included a total of 60 participants. All the study participants achieved the primary endpoint of ≥10% reduction in body weight in a period of 3–18 months postenrollment. [Table 1] presents the demographic profiles and the baseline characteristics, the values are represented as mean of 20 participants, of the age, body weight, BMI, and W/H ratio of the study participants. Participants in all the three groups were adherent to weight reduction programs and attained significant reductions in weight in 3–18 months from the baseline. The change in the body weight before and after ≥10% of weight reduction is presented in [Table 2]. There is a significant change in body weight in all the three groups (P < 0.05), the values are represented as mean of 20 participants. The distribution of BMI in all the three groups before and after ≥10% of weight reduction is presented in [Table 3], the values are represented as mean of 20 participants. The comparison of the mean BMI before and after weight reduction showed a statistically significant changes in the mean BMI between the groups (Group 1 P = 0.0001, Group 2 P = 0.0001, and Group 3 P = 0.001). The distribution W/H ratio before and after weight reduction is as shown in [Table 4], the values are represented as mean of 20 participants. The comparison of the mean W/H ratio before and after weight reduction where not so significant in all the three groups (Group 1 P = 0.601, Group 2 P = 0.716, and Group 3 P = 0.767). As shown in [Table 5], statistically significant changes before and after weight reduction were noted with respect to BI, PI, PD and CAL in all three groups. Furthermore, statistically significant changes were observed in the serum adiponectin and TNF α levels in all three groups before and after weight reduction. The serum adiponectin levels showed an increase in the levels following weight reduction, whereas TNF α levels decreased following weight reduction as shown in [Table 6]. The Pearson's co-relation showed a significant negative co-relation of adiponectin with probing pocket depth in all the three groups, as shown in [Table 7]. In patients with periodontitis, serum adiponectin levels showed significant negative correlations (P = 0.0001) with CAL as shown is [Table 8]. The association of obesity and periodontal disease is relatively well-established. Considering the high prevalence of obesity, periodontal disease and the resource limitations in Indian settings, it is important to assess and develop obesity-control measures that are easy on the cost and resource barriers. In this study, we have evaluated the impact of weight reduction on adiponectin and TNF-α levels in the serum of obese patients with and without periodontal disease. An important aspect of this study was that there was no attrition. All the 60 participants enrolled for the study completed it, this can be attributed to the high motivational levels of the participants to adhere to the weight reduction. On the premise of the findings of a 3-year weight loss study by Madsen et al., outcome measures (adiponectin and TNF-α) were assessed after achieving ≥10% reduction in weight. Madsen et al. note that long-term weight loss (3 years) must exceed 10% for achieving significant improvements in adiponectin levels. Although the current study noted these improvements in inflammatory markers in a period of 3–18 months, it may be important for participants to continue on the weight reduction programs for longer periods to consistently reduce the pro-inflammatory effects of obesity. The percentage weight loss in all the three groups was statistically significant. The evidence linking obesity and the incidence and severity of periodontal disease has grown in recent years.,,,,,, The risk of periodontitis is associated to be increased with increased BMI, waist circumference (abdominal obesity), serum lipid levels, and the percentage of subcutaneous body fat. Francis et al. showed a 30% increased risk for periodontitis per 1 kg/m2 increase in BMI. They concluded that the periodontal disease was associated with increased BMI establishing a link between obesity and periodontitis. Several studies showed similar results correlating BMI to oral health.,, These studies suggest a decrease in the BMI may have a positive impact on periodontal health. In this study, the comparison between the mean BMI before and after weight reduction showed a statistically significant change (P < 0.05) among all the three groups. This reduction in the BMI might decrease the inflammatory burden and hence have a significant effect on periodontal health. The percentage difference in the W/H before and after weight reduction in all the three groups were not statistically significant, Group 1 1.0% with P = 0.601, Group 2%-0% P = 0.716, and Group 3%-1.04% with a P = of 0.767. In this study, the PI, BI, PD, and CAL show a statistically significant change before and after weight reduction [Table 5]. The changes in the periodontal parameters without any intervention and just maintaining good oral hygiene and reemphasizing on the oral hygiene measures indicate that the mere reduction in the weight might bring about some reduction in the inflammatory burden on the periodontium. In the current study, there was an increase in the serum levels of adiponectin and a decrease in the serum TNF α levels after weight reduction of ≥10%. This showed a significant correlation with probing pocket depth in all the three groups (Group 1, Group 2, Group 3 all showed a P = 0.0001) and CAL in Group 3 (P = 0.0001). Thus, it appears that control of obesity can through correcting inflammatory molecules could have significant effects on clinical periodontal parameters. A negative feedback mechanism can be suggested because in obesity, plasma adiponectin levels are lower despite that adipose tissue is the only tissue of its synthesis. Weight loss would result in at least transient disinhibition, therefore an elevation of plasma adiponectin. Recent studies have shown that the expression of adipogenic genes was suppressed in the development of obesity and diabetes mellitus in mice argues for the existence of a feedback inhibitory pathway. This negative feedback mechanism might explain the increase in the adiponectin levels in all the three groups after weight reduction in our study. Moreover, this increase in adiponectin levels had an inverse relation to the PPD in all the three groups and CAL in the Group 3. Furthermore, there was a change in the serum TNFα levels in all the groups after weight reduction in the study. Puglisi et al. in their study stated that following weight reduction, there is a decrease in TNFα and C reactive protein levels and increased adiponectin levels, which is in accordance with the current study. Hence, decrease in the levels TNF-α and increase in level of adiponectin following weight reduction may effectively reduce the risk for chronic periodontitis among obese individuals. Results of this study indicate that there might be an association between the inflammatory effects of obesity and periodontal disease. Controlling obesity seems to have definitive positive impact on reducing the burden of periodontal disease. Ciao et al. noted that many obese individuals who might benefit from weight loss treatment perceive multiple barriers (including cost and time) to seek treatments and call for encouragement of less intensive treatments that are seen as more barrier-free. Results of the current study indicates that simple weight reduction programs with diet and exercise-related lifestyle modifications may be one such barrier-free option. In another recent study, Akram et al. noted a refreshing and reassuring observation that family physicians are generally aware of the associations of obesity and periodontal disease and show a positive attitude to refer obese patients to weight management clinical programs. Results of the current study may add more confidence and fillip for further research on this topic. The results of the current study indicate that controlling obesity presents a good opportunity to alleviate the inflammatory burden of periodontal disease. Simple weight reduction programs with diet and exercise may go a long way in controlling a multifactorial disease like periodontitis. In spite of our planned efforts, there are certain shortcomings in the conduct of the study. Use of the worldwide criteria of BMI guidelines as recommended by the WHO for the segregation of the population into obese and nonobese. The difference of opinion exists among the researchers with the use of BMI among the Asian population; anyways we have still considered BMI as the measure in our study along with W/H ratio as there are no other standard measures. Since our participants were highly motivated, our results may be partially due to the Hawthorne effect. Further research with prospective cohort studies can be conducted with multicenter trials to evaluate the impact of lifestyle modifications on periodontal health in obese participants and their influence on the inflammatory markers. This would also be helpful in better understanding of the role of adiponectin in the pathogenesis of periodontitis. Dennison EM, Syddall HE, Aihie Sayer A, Martin HJ, Cooper C; Hertfordshire Cohort Study Group. Lipid profile, obesity and bone mineral density: The Hertfordshire Cohort study. QJM 2007;100:297-303. Diet, nutrition and the prevention of chronic diseases. World Health Organ Tech Rep Ser 2003;916:i-viii, 1-149. Genco RJ, Grossi SG, Ho A, Nishimura F, Murayama Y. A proposed model linking inflammation to obesity, diabetes, and periodontal infections. J Periodontol 2005;76 Suppl 11S: 2075-84. Van Dyke TE. Inflammation and periodontal diseases: A reappraisal. J Periodontol 2008;79:1501-2. Virto L, Cano P, Jiménez-Ortega V, Fernández-Mateos P, González J, Esquifino AI, et al. Obesity and periodontitis: An experimental study to evaluate periodontal and systemic effects of comorbidity. J Periodontol 2018;89:176-85. Dursun E, Akalin FA, Genc T, Cinar N, Erel O, Yildiz BO, et al. Oxidative stress and periodontal disease in obesity. Medicine (Baltimore) 2016;95:e3136. Zhao B, Jin C, Li L, Wang Y. Increased expression of TNF-α occurs before the development of periodontitis among obese Chinese children: A potential marker for prediction and prevention of periodontitis. Oral Health Prev Dent 2016;14:71-5. Martinez-Herrera M, Silvestre-Rangil J, Silvestre FJ. Association between obesity and periodontal disease. A systematic review of epidemiological studies and controlled clinical trials. Med Oral Patol Oral Cir Bucal 2017;22:e708-15. Khader YS, Bawadi HA, Haroun TF, Alomari M, Tayyem RF. The association between periodontal disease and obesity among adults in Jordan. J Clin Periodontol 2009;36:18-24. Wood N, Johnson RB, Streckfus CF. Comparison of body composition and periodontal disease using nutritional assessment techniques: Third national health and nutrition examination survey (NHANES III). J Clin Periodontol 2003;30:321-7. Vanhala MJ, Kumpusalo EA, Pitkäjärvi TK, Takala JK. Metabolic syndrome' in a middle-aged Finnish population. J Cardiovasc Risk 1997;4:291-5. Madsen EL, Rissanen A, Bruun JM, Skogstrand K, Tonstad S, Hougaard DM, et al. Weight loss larger than 10% is needed for general improvement of levels of circulating adiponectin and markers of inflammation in obese subjects: A 3 year weight loss study. Eur J Endocrinol 2008;158:179-87. Nigro E, Scudiero O, Monaco ML, Palmieri A, Mazzarella G, Costagliola C, et al. New insight into adiponectin role in obesity and obesity-related diseases. Biomed Res Int 2014;2014:658913. Esfahani M, Movahedian A, Baranchi M, Goodarzi MT. Adiponectin: An adipokine with protective features against metabolic syndrome. Iran J Basic Med Sci 2015;18:430-42. Saito T, Shimazaki Y, Koga T, Tsuzuki M, Ohshima A. Relationship between upper body obesity and periodontitis. J Dent Res 2001;80:1631-6. Al-Zahrani MS, Bissada NF, Borawskit EA. Obesity and periodontal disease in young, middle-aged, and older adults. J Periodontol 2003;74:610-5. Saito T, Shimazaki Y, Kiyohara Y, Kato I, Kubo M, Iida M, et al. Relationship between obesity, glucose tolerance, and periodontal disease in Japanese women: The Hisayama study. J Periodontal Res 2005;40:346-53. Francis DL, Kumara Raja B, Chandran CR. Relationship of obesity with periodontitis among patients attending a dental college in Chennai: A cross-sectional survey. J Indian Assoc Public Health Dent 2017;15:323-6. Rabiei M, Saberi BV, Rad HM, Bahre Khazan SA. The relationship between obesity and oral health. Caspian J Dent Res 2017;6:36-44. Suvan JE, Petrie A, Nibali L, Darbar U, Rakmanee T, Donos N, et al. Association between overweight/obesity and increased risk of periodontitis. J Clin Periodontol 2015;42:733-9. Ali OH, Akram HM, Salman SA. The effect of obesity on the periodontal health status. Int J Adv Res Biol Sci 2016;3:178-82. Yang WS, Lee WJ, Funahashi T, Tanaka S, Matsuzawa Y, Chao CL, et al. Weight reduction increases plasma levels of an adipose-derived anti-inflammatory protein, adiponectin. J Clin Endocrinol Metab 2001;86:3815-9. Puglisi MJ, Fernandez ML. Modulation of C-reactive protein, tumor necrosis factor-alpha, and adiponectin by diet, exercise, and weight loss. J Nutr 2008;138:2293-6. Ciao AC, Latner JD, Durso LE. Treatment seeking and barriers to weight loss treatments of different intensity levels among obese and overweight individuals. Eat Weight Disord 2012;17:e9-16. Akram Z, Abduljabbar T, Hanif A, Khan A, Vohra F. Attitude and knowledge of family medicine practitioners towards the association between periodontal disease and obesity. Niger J Clin Pract 2017;20:595-9.